To help address this challenge, Nick Jackson, a Maria Goeppert Mayer Fellow at the U.S. Department of Energy’s (DOE) Argonne National Laboratory, has developed a faster way of creating molecular models by using machine learning. Jackson’s models dramatically accelerate the screening of potential new organic materials for electronics and they could also be useful in other areas of materials science research. Jackson’s research focuses on vapor deposition as a means to assemble materials for organic electronics. In this process, scientists evaporate an organic molecule and allow it to slowly condense on a surface, producing a film. By manipulating certain deposition conditions, the scientists can finely tune the way the molecules pack in the film. The packing of the molecules in the film affects the material’s charge mobility, a measure of how easily charges can move inside it. The charge mobility plays a role in the efficiency of the material as a device. To study this relationship, and to optimize device performance, Jackson’s team runs extremely detailed computer simulations of the vapor deposition process. “I drop my hands and leave it to machine learning to regress the relationship between the coarse description and the resulting electronic properties of my system,” Jackson said. “We are developing cheaper models that still reproduce all of the expensive properties,” said Jackson. Shortly after Jackson began his appointment under University of Chicago professor and Argonne Senior Scientist Juan de Pablo, he had the idea to accelerate his research with machine learning. He then took advantage of the laboratory’s high-performance computing capabilities by collaborating with Venkatram Vishwanath, Data Sciences and Workflows Team Lead with the Argonne Leadership Computing Facility, a DOE Office of Science User Facility. “In the physics community, researchers try to understand the properties of a system from a coarser perspective and to reduce the number of degrees of freedom to simplify it as much as possible,” said Jackson. Although the targeted goal of this research is to screen vapor deposited organic electronics, it has potential application in many kinds of polymer research, and even fields such as protein science. ​“Anything where you are trying to interpolate between a fine and coarse model,” he added. In addition to its broader applications, Jackson’s advancements will help propel organic electronics towards industrial relevance. A paper describing Jackson’s approach, titled ​“Electronic structure at coarse-grained resolutions from supervised machine learning,” was published on March 22 in Science Advances. This research was funded by Argonne’s Laboratory Directed Research and Development (LDRD) program and DOE Office of Science, Basic Energy Sciences Program. 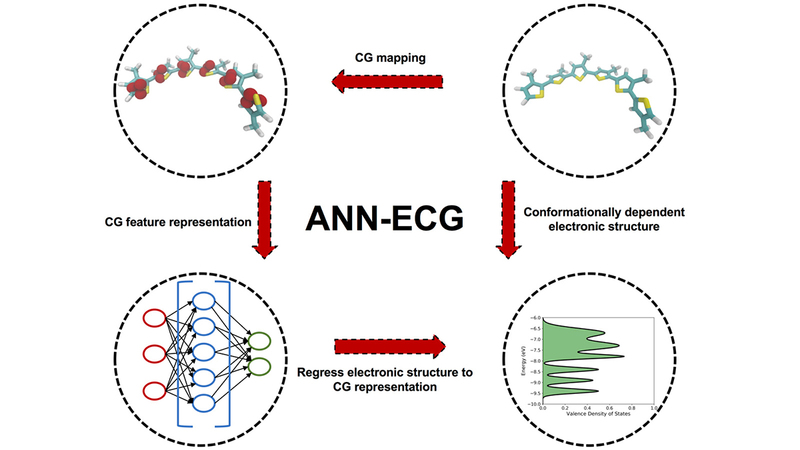 Schematic of the ANN-ECG method used in this work. Schematic example shows a three-bead/monomer coarse-grained molecular model mapping for sexi(3-methyl)thiophene.